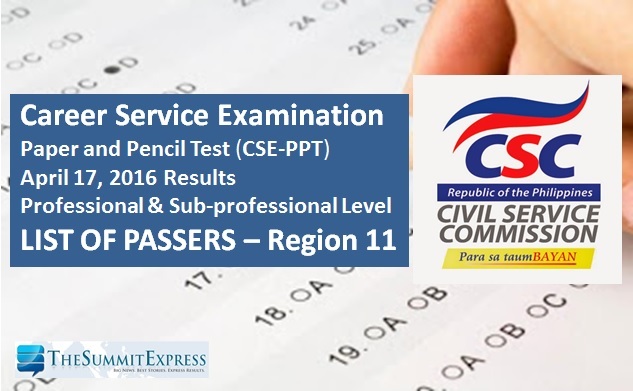 Congratulations to all the passers of April 17, 2016 Civil Service Exam - Paper and Pencil Test (CSE-PPT) known as the career service exam for Region 11 (Davao Region). The Civil Service Commission(CSC) officially announced that 1,208 takers passed the professional level examinations. On April 17, a total of 229,463 took the examinations in different test centers nationwide. Below is the alphabetical list of successful examinees for Region 11 (Davao, Digos, Mati, Davao Oriental, Panabo, Samal, Davao del Norte, Tagum) civil service exam (CSE-PPT) professional and sub-professional level.